This is one of my favorite times to be productive. This time just after Christmas when life is a little more flexible. The family is happy with a crock pot dinner of barbeque sandwiches and I can go camp out in the sewing room. I always encourage the girls to have friends over, they have the company and I can check in periodically. My productivity rate is higher when others are around. The most recent quilt is at a stand still. My trip to the LQS about 30 minutes away was a bust. After calling a friend to make the trip with me, we arrived to find the store closed for the holiday week and reopening after the New Year. What a bummer. We had talked of going to another shop about 30 minutes from our homes…but at least 45 minutes from our current location. Her roast in the oven and an extra teenager at our home suggested that we wait for another day. What to do? What to do? Start another project! With some of the left over fabric from THIS project, this was created. Please, I need some opinions about using the blue or white as a background. The plan was the blue, but now I think the white seems more crisp and fresh. This is designed after the Moda Bake Shop quilt Sugar Pop n Change. Soo, not much in the way of fabric left, not enough to make the center square. Some of those best design moments are those that come about from necessity. The stripe fabric is going to be the border. These are a couple items that arrived under the tree last week. If 4 of these are cut and arranged in the middle block….that should work. The dark more solid turquoise is a looser woven fabric…it might fray even with wonder under. The other dark turquoise with more green fabric is down to a small bit, but should be still available at the store 10 min. away. That fabric is LQS quality, any opinions. Think about the blue vs. white background fabric. There is enough of the stripe fabric that a block log cabin style or possibly fussy cut and mirror image is an option. The new Go cutter needs some use though. Let me know if you have a preference for the Die on the right or the left. Can’t wait to hear all the opinions. I would like to wish you and your family a Merry Christmas and Happy Holidays. Please stop and smell the tree, the food and all of the good cheer. Smile for the good things in life, we all have something good in our life. I am blessed with a dear husband, two fine teenage girls and a beautiful home. Our family all have jobs (MJJR starts volunteer refereeing next month). We all are in good health, even if Lola finds out she has a dry socket from her wisdom teeth withdrawal (we find out Wednesday). And, God looks over us every day. I cannot think of a better life. The busy time of the season sometime has us forgetting this, my last Christmas card went out yesterday! Exciting News…..the quilt blocks are done and all sewn up. After looking at the quilt blocks in the layout on the wall last, I made a change. The blocks were arranged with the dark blocks in the middle and the light blocks on the outside. The quilt is lovely that way, however with the plain border that I am hoping to place around the outside, I thought a more random layout of the blocks was appropriate. After looking at the blocks with the intended brown batik in my possession, a shopping trip is required to pick up a new shade of brown, something with a taupe undertone. The Geminid Meteor shower is very visible tonight in our area. With my warm socks, slippers, coat and a brown and turquoise quilt that needs a little breaking in, I curled up on the driveway and watched the meteors for awhile. Some were so bright. This was something that I have always wanted to do. The family are all asleep and it was so peaceful. Thank you God for all that you bring into my life every day. Rarely do I take a quilt to the quilter. Most of you have seen this quilt in progress. The binding was put on last month. The fabric was a splurge quite a few years ago…the spending of a birthday gift certificate. It is one of the few quilts that went to the quilter. It turned out so well. This matches my living room. It is hard to tell if it just needs to be broken in, or if it is too large. It seems so awkward and just a little crunchy on the back of the couch. It is also very hard to get a good photo of this. The light and dark don’t like to play well with no flash or a flash. This one is pretty true to the look of it. This last project is the current design wall. This is for a fellow graduating in the spring. All the blocks are complete. 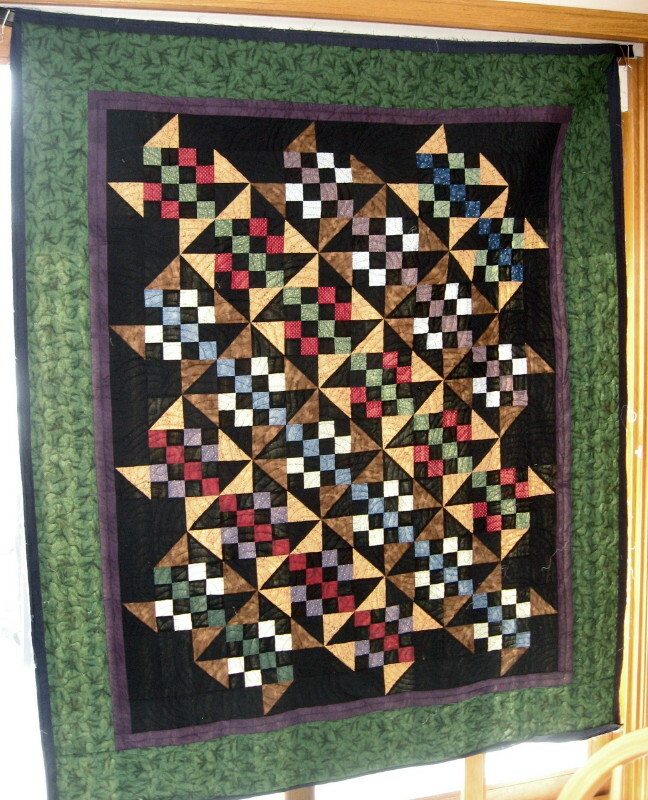 This quilt is based on Judy L.’s “The Brown Quilt”. The border fabric is still in debate. The LQS thinks the coloring of the planned brown batik is off…it is just a plain brown batik…how off can it be. Other Design Wall’s can be seen at Judy’s “The Patchwork Times”. Where does the time go, how long it has been from my last post? Our family has made a couple trips-to the Carolina coast and another college visit. Basketball season is finishing up, school ball will start in January. Lola has found herself a boyfriend….his car likes to break when Lola is around, bad brakes and a dead battery. Lola is getting 4 wisdom teeth out at the end of the month. DH is traveling more than ever. Family has come to visit a couple times this fall. Lola graduates the spring. Time to start working on the yard. The more that is done now, the less for later. We put some new stones (over 250lbs each) in for steps off the deck. Lola’s new boyfriend came in handy that day. Our church group adopted a local family. The family has 2 small daughters and a new baby boy. These doll quilts and something for the little one will get wrapped up soon. The Christmas Traditions quilt was auditioned off last weekend. The quilt went for just over $200. That is the highest bid ever on any of our quilts. 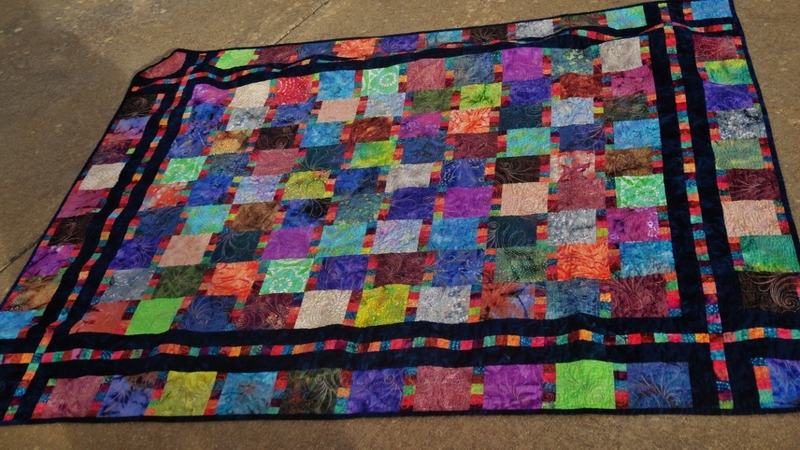 The high bid was from a past quilter from our group. She moved out of the area last year. The next quilt is in the works. Judy L.’s “Design Wall Monday” always seems to come and go. The post will get started but not finished. Check back in tomorrow and see what is on the wall now. This week I have been working on the Christmas Traditions Quilt. Our group now has all but 1 of the blocks done. My quilting finger is currently all tired out. I will give it a few days and probably start back to it on Thursday. While giving my fingers a break, I decided it was time to pick the knitting back up. I wanted to put something on my needles, for those time waiting at Weight Watchers or a doctors appointment. After making a few pairs of socks, it is time to try something different. Our family does not need another blanket in the house, no afghans patterns. I do not like anything around my neck, no scarfs. The purchased mittens are perfect as they are. So what can go on the needles that is useful……a top of some sort. Off to the library, 3 of them actually, checked out about 12 knitting books. Finally, a pattern that isn’t too hard, that is attractive and isn’t such a large commitment that it will be years before it is finished. This yarn was purchased at Hobby Lobby on clearance for $1.79 a skein, back in May on a trip to Chicago area with DH. It is a smooth misty grey made of bamboo rayon and acrylic, and just feels wonderful. This is the goal. It should look nice under a cardigan (especially one hand knitted in a year or so) or a suit coat. The hot flashes have been starting up again and this won’t be too warm, even with something over it. The girls have gone back to school. MJJR is helping with statistics for the volley ball team. Lola is working way to much for a senior in high school. DH is traveling as always. Me…I am trying to stay motivated to just accomplish something. I have a hard time living so much of my life alone. I work part-time, a couple days a week, and don’t think that I want to increase my time there. I volunteer and help in the community, but this is as time allows, or motivation moves me. I just have a hard time getting moving sometimes. What am I doing? We are hand quilting the Christmas Traditions quilt that will be silent auctioned off in December. The squares were donated to our group from one of my co-workers. She had made 48 of them….she didn’t really like them. She does now! I am working on the last couple squares, it isn’t so much fun to work on this at night. We are planning on 2 rows of straight line quilting in the sashing and haven’t decided on what to do in the borders yet. The green is a small stripe with metallic gold between the 2 shades of green. I have been working on some of my own stuff while the other quilt is making the rounds. This top is from fabric I purchased at Joann’s last summer when we were by Niagara Falls. Here is the post when I started the project. The fabric was a deal. I think it turned out pretty good. It can now get in line with the other quilt tops for finishing. I did realize last week that my nephew graduates in the spring. I believe he needs a quilt to take off to school. I think that will take priority over some of the other things that I have going. I don’t want to do sew binding on the way to graduation. I did finish a set of socks last month. I gave them away already. I loved the colors. Here are early pics of them. I need to get moving for the day. Harvest time is here. My beans need picking, taxes need paying and bed needs a making. Summer in our house is crazy. Life is crazy most days anyway, but summer just seems to expand the problem. I work part-time, have 2 teenage girls, have a husband that travels and our family just goes. The family has enjoyed more of the DH’s travels by accompanying him on some of his jaunts. Lola spent 3 days in downtown Chicago while DH was in meetings. I was a little hesitant to let the 17 y/o loose in downtown Chicago…but she graduates in the spring. After 3 days in downtown, they came out to the suburbs where MJJR and I met them for another couple days. We managed to get the school shopping done, except MJJR’s long pants. Every time she puts on a pair of pants they are too short. We decided to wait until we are into cooler weather and they might last more than 3 months. Both of the girls are now as tall as MOM! And both have bigger feet. The sewing machine has run but not much recently. I quilted up a pair tops back in April. A friend had a pair of grandbabies coming. We finished the quilts and she moved to Florida to be closer to the family. More power to her. We spent some time in Indiana looking at more colleges. Applications open next month. MJJR was pleased we fit in a WNBA game while in Indianapolis. I am working on another pair of socks. Yarn that I have had for a while. Another trip with the husband was also to the Chicago suburbs…Geneva. A lovely town with a nice needlepoint store. Though I really don’t need another hobby, they do have beautiful scissors. The bargain basement area was also grand. The “yarn” was less than $2 a hank. This is lace weight as what was used on Lola’s hat. I will have to get a pic later. If I don’t send this post out then it will be found months from now. I felt like an independent woman after a visit to “Home Depot” in May. I picked up some lumber in my Taurus (they made 1 cut so it would fit), cut it up with a saw and made a large style ironing board. Imagine the old commercial with the woman working, whip it up in the pan, cause I am a WOMAN. I think it was for Charlie cologne. My ironing board is getting pretty old and is a little wobbly. I might have to upgrade it. I think it is older than the marriage. I am hoping to post more frequently. On the first day of Spring Break-2012, I took my family to Illinois State University. We looked at the college campus. I found the dorm hallways to be very small. The room size is okay and the bathrooms are community. I don’t mind this, however, I won’t be the one living there. The elevator stops only on every third floor, if you live on the other floors, you have to walk up one flight, or down one flight. Moving day sounds like fun at a place like this. The tallest dorm in the US, so they say. The rest of the campus is beautiful. On day two of Spring Break-2012, I was suppose to work. I took the day off. To do what, you ask! I went to see a famous quilter! It cost me a whopping $5, because I am no longer a guild member. Best money I’ve spent in a long time. I had a great time. I picked up the “Leaders and Enders” book, and showed off my version of the “Patches and Pinwheels” quilt. On the third day of Spring Break-2012….I have to go to work. by sewing the small background spacer fabric to the “Sticks”. Layout was so much easier when these small pieces were already sewn together. The 1 background piece was sewn onto all the “sticks” then set aside 1 of each fabric and finished sewing the remainder of the background fabrics on. Layout happened on the floor. I was approached again about teaching another class. The class is on 4/12 with a finishing session on 5/3. The quilt will be the “Patches with Rows” inspired by Bonnie Hunter’s “Patches & Pinwheels”. Our quilts look so different but are all the same construction, color placement is the only difference. Tomorrow is sewing day with a friend. 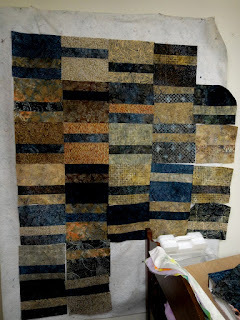 I am looking forward to working on some borders and piecing backs together. I hope I can send some tops off to the quilters. I was trying to get this post done before tomorrow. the car needs to go to the shop early in the morning. Didn't mean to post it tonight! Last month I attended a quilting retreat with 8 others. This started as a charm pack and a jelly roll purchased on clearance at the Joann’s in New York last August. I also have 4 fat quarters of the same fabrics, all for the low price of $12. This pattern was picked up at the LQS on my way to retreat. The LQS sends us $5 coupons on a $10 purchase during our birthday month. My purchase came to $8 (thread) so I threw this in. The pattern had caught my eye at Ben Franklin’s, where it was on clearance. I had thought I could live without it, the next visit a week later, it was gone. Once it was gone...I wanted it! The whites need to be cut. A couple of the ladies from my first quilt class asked if I would teach another class. I said yes, of course. What to teach? Something good for a beginner, but something that will hold the interest of someone with more experience. Here are the options given. This one is from the current issue of American Patchwork a nd Quilting. If this is to be a true option, I need to get busy and make it. I did some cutting yesterday. This fabric is from Maui a few years back. This will be another memory quilt for the family. The other option for the class is my version of the Bonnie Hunter’s “Patches & Pinwheels”. What fun it will be to figure out yardage for this quilt. The dark brown and light brown that highlight the 16 patches were each a fat quarter, if I remember correctly. So far, one vote for the “Patches and Pinwheels”. Last year I participated in Judy L. UFO project. This year, no list was done, but so far, I have finished 1 project a month. I plan to keep up the progress. January’s finish was the Christmas quilt. This quilt actually was the January UFO last year for Judy’s project. I put it on the back burner after the back fabric bled. A friend organized a retreat for a few of us in February. Thank you again, Kim. That dedicated time allowed for February’s finish. The color is way off on this. Here is a better view of the coloring. 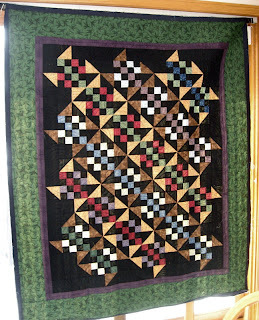 The quilting was finished during retreat and binding attached. This project was next in line at retreat. It was already cut & organized, prior to retreat. The pattern is the same as the quilt above. The quilt is made with all fat quarters, except the black. Wouldn’t you know, I ran out of black at retreat. Had to run to the new quilt shop for more. The shop opened in the small town where we go for retreat. It is “Stitches N Stuff” in Dewitt, IA. The shop had just what I needed. The owner even gave us quilt “candy” for having our retreat in the area and coming in to her shop. The top is almost done. It still needs one border. It sat for a day, until the borders finally fell into place. The corner stones will be the flowery material and the sides will be scrappy with the solid style “batiks” with black between each. The border will be fairly small….I don’t have much fabric left…remember fat quarter-that can no longer be found. The black frames are only 1 1/2” cut. The small black frames might look odd with the binding if it is larger than 1/4” and my binding is always bigger than that. One quilt did get layered up at retreat. Used up another roll of batting! I think this is my third roll. It will be awhile before I buy another roll. Four quilts are already layered, 3 of which just need finishing touches on the outer borders. Two quilts are ready to go to a quilter. Most I quilt myself, I need to do some hunting for a quilter. These are larger quilts and it's time for a professional. We had some unexpected company over the weekend. My mom called on Thursday and asked if she and my step-dad could come for the weekend. Of course. It was so nice to see them. My parents have had a rough time. My step sister and I have both had some health issues recently. She has breast cancer (starts radiation next week) and I landed in the hospital just before Christmas (they think I have had a heart attack in the past—I am 43). I have had a battery of tests, they haven’t found anything significant. I am waiting for more results now. The worst right now is possibly a stint. My step sister is having a hard time with the diagnosis. She had a lumpectomy and is doing okay. Sooo, to hasten up the waiting, I have been sewing. I finished the Christmas Quilt, knitting my socks and a small scarf (haven’t shown yet), added some quilting to a quilt (it will hang at the library for February) and started a new project. This is a project that I have had in mind for a while. The fabric is a couple years old from Hancock's. The prints are from their turn style display of fat quarters. The rainbow colors were a fat quarter roll I bought with a coupon. The blacks were just something I had in the stash. The frames are solid black. I ran out so the small squares are a swirl. Everything looks better in black. The framed blocks had been pinned and the rainbow colors were cut, prior to yesterday. Still lots to do, but progress. I have enough of these blocks to go 7 x 9 with no borders. I hadn’t planned on a border, but I have a little left over, so it might get something. It should make a nice lap size quilt. The blocks finish at 8”. Back to the hospital thing--the whole thing came at the most inopportune time-vacation time. We left for the airport just 3 hours after arriving home from the hospital. Many tests were run before they could ensure I could safely leave the country. A few items added to my bags, which were mostly packed, and we were off. We drove into Chicago that afternoon and picked up the plane the next morning. We took a cruise over Christmas and New Years. We arrived home not much before the Costa Concordia ran aground. We were on the “Allure of the Seas”. The largest passenger boat out there. It was beautiful. This is the view from our room coming into the 1st port-St. Maarten. We had to cancel two of the excursions planned—a zip lining adventure and underwater snuba (the old helmet style scuba gear). We ended up with a swimming with the sea lions (very relaxing) and Segway's on the beach (an avid drivers dream). The family time, sun and fun were just what the doctors ordered. Enjoy every Day and Thank God for your blessings! I had some goals that did not get accomplished last year for Judy L.’s UFO Challenge. My first fail was…JANUARY! I tried so hard on this quilt to get it done. You can see my progress here. I ended up having problems with the backing bleeding on to the light top fabric. The quilt has been picked up and some work has been done on it throughout last year. I wanted to get it done by the end of January 2012. The back fabric that bled has now been removed and replaced. The outer fabrics were put back on after lots of quilting ripped out. The quilt became washed out with my efforts to remove the coloring that bled. The binding will be finished today. The binding is the original coloring. DH thought it would accent well, and required less work. I like it. It is a disappointment that this quilt doesn’t look like I imagined. It is a beautiful quilt, but reminds me of the horrors every time I look at it. I am excited to be able to call it DONE!